Autism has hit close to home at ​MortgageTree​ and our Partners, and as such, we have a very specific and heartfelt interest in helping support, and give back to this community. MortgageTree ​donates a percentage of our earnings to assist families with Autistic children through ​Autism Calgary​. Autism Calgary is a voice for families affected by autism, while offering education and support within the community. They are advocates for the best quality of life possible for those with autism and promote the continued research and advancements in treatment options available. We are proud to be committed to this worthy cause. Danielle deNance is a teacher with the Calgary Board of Education in Early Childhood Education. 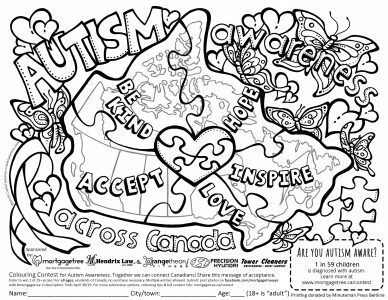 She has created a wonderful lesson plan on Autism using the Mortgage Tree colouring page as a tool. Danielle was inspired by our contest and message about Autism for you to learn, share and spread the word about Autism Awareness. Join in this Fun Contest to Help Raise Awareness and Funds for Autism Calgary! Win Amazing Prizes! With 1 in 59 children now being diagnosed with Autism Spectrum Disorder (ASD), it’s likely you now someone affected by thIs lifelong disorder. DOWNLOAD / PRINT THE CONTEST COLOURING PAGE! Print this free download… then… print a bunch more and give them to everyone you know (hey – it’s worth asking you, LOL)! Post your photo with the hashtag #towercleaners and #artwithcrystal in the description. Multiple entries are allowed so colour as many as you can!!! Multiple entries allowed, as long as each entry is a different, original coloured page! 1st, 2nd and 3rd prizes are chosen by Hendrix Law and Mortgage Tree. Runner-Up awards are randomly drawn – everyone has an equal chance to win! Proceeds will be donated to Autism Calgary to assist families who have children with Autism Spectrum Disorder. We look forward to seeing your awesome colouring!